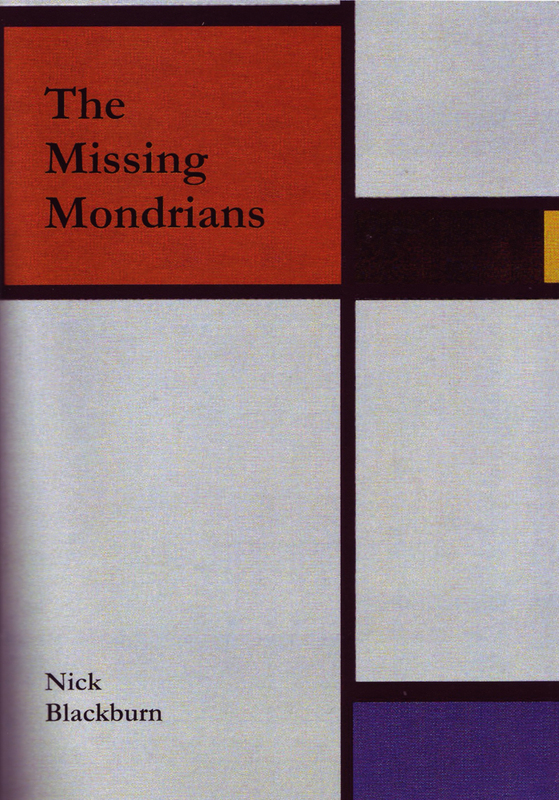 As documented in the notes, all the Mondrian works are now shown. Completed on 4th June 2012, that has taken just eleven years. and a straightforward means of identifying the abstracts is given here. With the benefit of hindsight, it becomes clear that PM quickly developed a sense of tight composition; that he then learned to play with colours and textures (influenced by Van Gogh and later the Cubists); that he gradually transformed these images to the stark 'lines and compartments' which came to define his unique vision, while simultaneously crystalising his palette to primary colours. See note 1. On completing the abstracts, see note 2. Olga's Gallery does a similar job well. 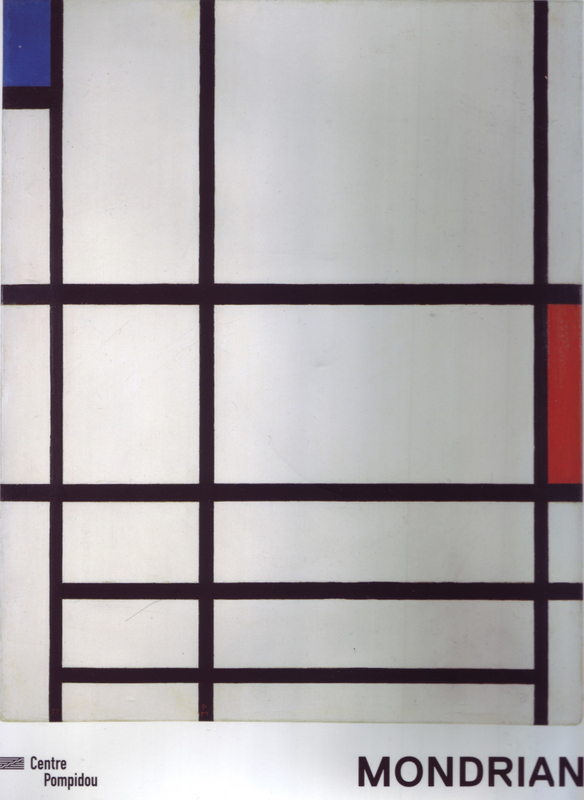 Artcyclopedia's Mondrian Online is also worth a look. title, date, medium, size, reference, location. For the abstract pictures only, I have added the Seuphor, Ottolenghi and Blok reference numbers where available (if there isn't one, this is shown as S-, O- etc.). Starting in August 2011 and following on from the Identifying Mondrians exercise, I will gradually add the BMI coding. I might add the signature details later [signatures for the later abstracts completed December 2010]. 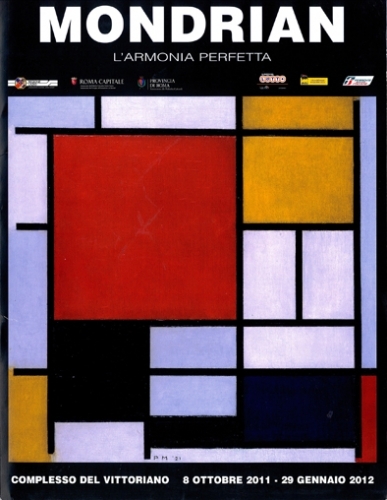 These 18 works appear in the book Mondrian: The Transatlantic Paintings. I have also added the 'T' reference for these. A slowly growing collection of companion pieces from other artists. Homages to that specific work. There is also a large collection of general homages here. I guess that the distinction between a companion piece and an homage (for the purposes of these pages, at least) is that the former are by recognised artists. My guess at the colours for those paintings not yet sourced. All the Lozenges are gathered here. Reconstructions (where necessary and possible) of the 24 lost Mondrians. Pieces I have recreated in stained glass. 1. 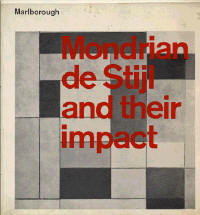 I was rather pleased with that paragraph, but by a magnificent coincidence, my bedtime reading on the very night I posted it (15th August 2010) was a catalogue for the 1964 exhibition, Mondrian de Stijl and their impact. I bought it in October 2002 but this was the first time I had read the jolly interesting article in the catalogue by Prof. 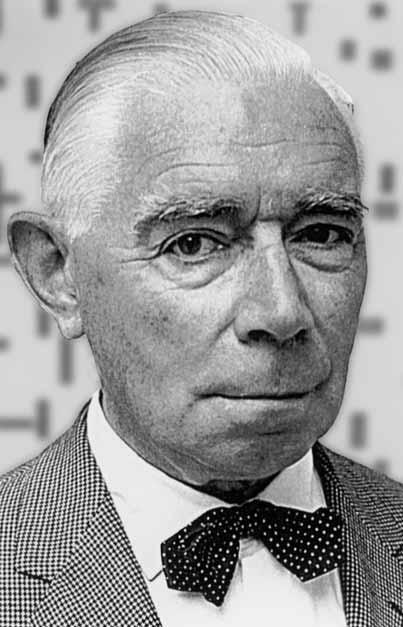 A.M. ("Bram") Hammacher. Let us remember that Mondrian, who was 38 when, in 1910 or 1911, he discovered Cubism, was originally a genuine late impressionist of the Dutch School. As a result of his academic training he was entirely devoted to the refinement of a spiritual art inspired by nature. In fact, French impressionism, neo-impressionism, Van Gogh, Cézanne and Gaugin had failed to touch him. He had heard about these artists and had seen something of their works, but he had not made use of them. So it goes. It is a good article and an engaging exhibition. I would have liked to contact him but regrettably he died in 2002. I will probably try to reproduce the text and images when my OCR capability is restored (through the efficacy of buying a new scanner that talks to the Mac in sufficient detail). 2. I finished the first draft of the revitalised Mondrian Pictures in September 2010, including at least a black and white image of all but one (B179, no information available) of the abstract images (as defined by CR) and since then have been trawling online and elsewhere for colour images of those outstanding. I am prepared to create my own where necessary (see the Reconstructions for the 24 lost Mondrians), but have been making steady progress on those pieces which still exist. A major source will, I hope, be the V&A Library, but in an October trawl I found Michael Sciam's site and this guy is one of the few who has devoted more time, effort and thought to Modrian's work than me. His writings on the subject are backed up by a series of pdf files which contain small images of most of Mondrian's later works and there are a dozen of these for which I have not yet found colour images. Michael has kindly consented to my using his images. For reference, they are B135, B141, B143, B162, B172, B192, B203, B225, B227, B228, B242, B270, B271. 3. 1940 completed (colour images obtained for all the works) 16th November 2010. The current score for abstracts is roughly: 1940 27/27; 1930 54/60; 1920 67/107; 1910 82/103. Overall, 230/282. 4. As at 21st December 2010, 1930 is complete (if we accept small colour images) with the exception of B251, for which there is a lead. 1920 lacks 24 out of 107 and 1910 perhaps 11 of 103 ('perhaps' because it is arguable how many of the sketches are worth pursuing). That brings the score to around 246 out of 282. A visit to the V&A library in the new year should sort out most of the later works. See facsimiles. 5. 11th Jan 2011, I am going to split the larger pages into two as they will not load into some mobile devices. 6. 14th Jan 2011, A fascinating day at the V&A Library, and many thanks to their enthusiastic staff. I brought back a large number of photographs, several of which provide new images plus numerous improvements on existing images and a several Companion Pieces. There were also some disappointments. It will take a few days to sort out and insert the new data and I will report a new progress count when complete. [17th Jan] Five extracted, B109, B139, B183, B196 and B199. Mondrian in the USA has also arrived in the post - no new images there (I was quite excited at first but eventually realised that some of the paintings are shown on their side or upside-down), but some new photographs which I will incorporate in due course and it looks like a good read. 8. 7th Feb 2011, I am minded to start collecting closeups of the signatures. There are some on Flickr and I'll check my books for decent images too. 9. 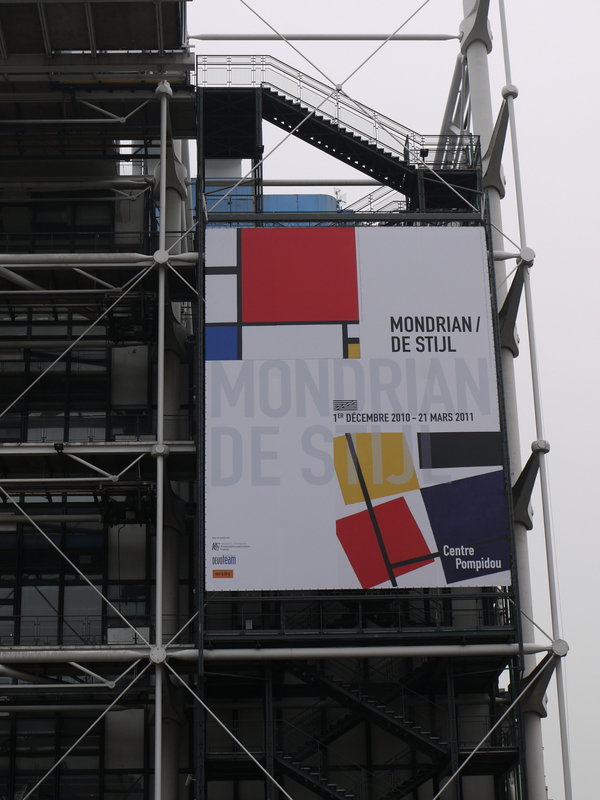 26th Feb 2011, just back from the Mondrian show at the Pompidou. It is an absulutely brilliant show with an astonishing range of works to see, both from Mondrian and from the rest of the De Stijl group. One factor which really surprised me was the size of some of the pieces: although I show all the dimensions on the site, I had not really paid attention to them: some examples of surprisingly large works are A593, B1, B102+3. The exhibition catalogue will fill a few gaps on these pages and also provide some companion pieces. The exhibition also answered a question I have asked a few times over the years - yes, there is a film of Mondrian: with Calder and a kitten, though I have not yet found it on the net. The only downside was a ban on photography, and so I could not snap the signatures on the paintings. 10. 17 May 2011 My next inclination is to add the first owner to all the real abstracts, i.e. B104 onwards. And a page of auction results. [18 July 2011] owners complete - I have listed them all, not just the first owners. Auctions still intended - started August 2011. 11. 6th Jun 2011 - I'm trying to wrap up the Reconstructions so that I can self-publish a small booklet on the process. I'll go with the information I have and hope to refine the solutions over time. 12. 9th August 2011 - Usborne's Understanding Modern Art is a jolly good book. 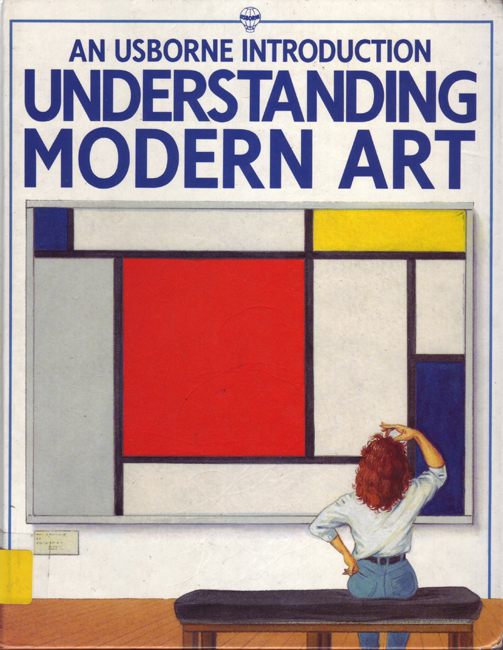 I was, of course, attracted by the cover which shows an excellent painting, but not a real Mondrian. In order to check that, I had to scan through all the paintings from 1920 through 1940+ and it occurred to me that an easier way would be useful. I have in mind a classification of all the relevant paintings from 1920 onwards, listed by the number of primary colour planes, so the Usborne cover would be "112", i.e. 1 red, 1 yellow and 2 blues. [20th August] a working version is now available, though improvements are planned. A count of black planes has been included, so the book cover would be 1120. Here's the link. I will add the identifying code to each of the picture listings over time. 13. 6th December 2011 - Having built the flowers page, and having more-or-less completed the abstracts, I am toying with notion of returning to the original plan of showing all the pictures. I will not be so obsessively completist as to pursue them all, but might put up all those I have available in colour: a long term aim. [16th Dec] Initial scans complete, ready to start the additions: I will annotate them as Ph3 (phase 3) in case global edits or other fiddling is required. Many of the non-abstract pieces are currently just listed by title and those lists could be useful in themselves, so I'll try to keep them: perhaps a list of 50 titles, then the pictures available. Some of the scans leave something to be desired as they are truncated on one edge or partially out of focus because a full and flat scan is not possible without damaging the source books. I will persevere in providing the best images available, but embrace the 80% solution of most of the picture being immeasurably better than none at all. [20th Dec] Data entry to A600 complete - that's the most tedious task done. [24th Dec] All titles now entered and addition of images in progress. Then entry of the details for the images. [30th Dec] All titles added and full text complete to A450... all now done. Probably the Gemeentemuseum catalogue next. [5th Jan 2012] Les chemins de l'abstraction scanned before the Gemeentemuseum catalogue as the images will probably be larger. About 30 new images generated, currently being processed and added. [6th Jan] Entries from Les chemins complete, Gemeentemuseum catalogue next. [7th Jan] Titles entered for the sketches. A preliminary trawl through the Gemeentemuseum catalogue suggests that there are around 130 new images available. [17th Jan] All Gemeentemuseum catalogue images processed and added to A100 / to A196, 18th / to 450, 21st / to 499, 22nd / 700, 24th - that's the early non-abstract, prefix 'A's complete. [25th Jan] Sketches and Late Naturalistic works done, that's the Gemeentemuseum catalogue completed. [27th Jan] Surprisingly, there are no new colour images in Bax Compleet, though the many B&W images are better than those in the Catalogue, so if I eventually show all the pictures (and I suspect that I may), it could prove useful. Perhaps next a quick trawl of the new Rome exhibition catalogue and then the rest which probably means much looking and not much finding. [24th Feb] Images from Bois, the Logboek and L'armonia perfetta added. Next two recently acquired books, the catalogue for the 1965 Galerie Beyeler, Basel exhibition and Two Mondrian Sketchbooks. And some homages from Hai Mai Visto Mondrian (Have you ever seen Mondrian?). [23th Apr] I have taken a break from this exercise, spending some time on stamps, but was dragged back to Mondrian-bagging today by the estimable MutualArt.com site which logs auction results and provided half-a-dozen new images. [1st May] The time has come to show all the paintings, using temporary black-and-white images from the Catalogue where colour images are still being sought. There are four separate processes: 1. scanning; 2. extending the listings; 3. adding details; 4. adding the images. Plus, possibly, page reorganisation as they get too large. I will continue to log progress here and identify the entries as Ph4. [14th May] Pre-1900 complete and approaching half-way on the 1900s: up to A349 on the way to A710 (with a few late Cs to finish). [3rd June] 1900s complete. Scans done and processed for all the pre-abstracts, so it's just a question of running through the image adds and data updates in batches of fifty for 1910 onwards. [4th June] Complete. All the picture details for 1910 and the Late Naturalistic Works are in with temporary images. Notes have been made of colour image sources and these will be pursued, together with the books and catalogues in stock which have not yet been plundered. 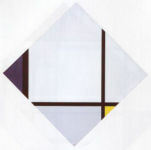 [5th June] Mondrian in the Sidney Janis Family Collections provided half a dozen new images. 14. 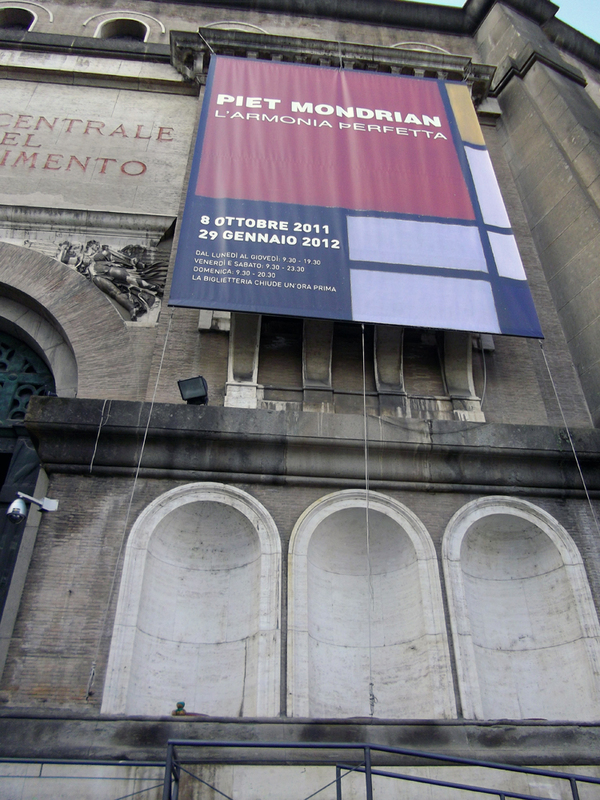 January 2012 - We visited Rome for the L'armonia perfetta exhibition. There was a marvellous range of Mondrians on show, from throughout his career, which was perfect timing for my extended interest in his earlier works. In addition, a few pieces from other artists were terrific , particularly a Rietveld chair and, best of all, three pieces from Marlow Moss, the first I have seen. This put me on the trail of new Moss documentation and me led to a PhD thesis on Moss from Lucy Howarth, available from the British Library EThOS service. It's an astonishing body of work, tells all that is known about Moss and includes a Catalogue Raisonné of her paintings and other pieces. 15. March-May 2012, several visits to Mondrian || Nicholson: in Parallel, just up the road at the Courtauld. 16. June 2014, Margate's Turner Contemporary, 70 miles east, has Mondrian and Colour, tracing his early development.